Nuclear Power: A Hedge against Uncertain Gas and Carbon Prices? High fossil fuel prices have rekindled interest in nuclear power. This paper identifies specific characteristics making nuclear power unattractive to merchant generators in liberalized electricity markets, and argues that non-fossil fuel technologies have an overlooked option value given fuel and carbon price uncertainty. Stochastic optimization estimates the company option value of keeping open the choice between nuclear and gas technologies. The merchant option value decreases sharply as the correlation between electricity, gas, and carbon prices rises, casting doubt on whether merchant investors have adequate incentives to choose socially efficient diversification in liberalized electricity markets. The impact of induced technological change (ITC) in energy/climate models on the timing of optimal CO2-abatement depends on whether R&D or learning-by-doing (LBD) is the driving force. Bottom-up energy system models employing LBD suggest strong increases in optimal early abatement. In this paper we extend an existing top-down model supporting this view according to the notion that socio-economic inertia interferes with rapid technological change. We derive analytical results concerning the impact of inertia and ITC on optimal initial abatement and show a wide range of numerical simulations to illustrate magnitudes. Inertia now dominates the timing decision on early abatement, such that LBD might even have a negative effect on early abatement and the impact of R&D is limited. However, ITC still reduces costs of stabilizing atmospheric CO2-concentrations considerably. Using a variant of the IMF's Global Economy Model (GEM), featuring energy as both an intermediate input into production and a final consumption good, this paper examines the macroeconomic implications of large increases in the price of energy. 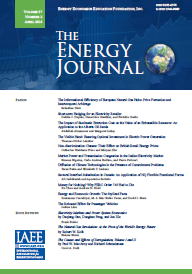 Within a fully optimizing framework with nominal and real rigidities arising from costly adjustment, large increases in energy prices can generate inflation persistence similar to that seen in the 1970s if the monetary authority misperceives the economy�s supply capacity and workers are able to temporarily resist some of the erosion in their real consumption wages resulting from the energy price increase. In the absence of these two responses, the model suggests that energy price shocks cannot generate the type of stagflation witnessed in the 1970s. The analysis goes some way toward reconciling the results found in the empirical literature on the changing nature of the macroeconomic implications of oil price shocks. The movements in oil prices are very complex and, therefore, seem to be unpredictable. However, one of the main challenges facing econometric models is to forecast such seemingly unpredictable economic series. Traditional linear structural models have not been promising when used for oil price forecasting. Although linear and nonlinear time series models have performed much better in forecasting oil prices, there is still room for improvement. If the data generating process is nonlinear, applying linear models could result in large forecast errors. Model specification in nonlinear modeling, however, can be very case dependent and time-consuming.In this paper, we model and forecast daily crude oil futures prices from 1983 to 2003, listed in NYMEX, applying ARIMA and GARCH models. We then test for chaos using embedding dimension, BDS(L), Lyapunov exponent, and neural networks tests. Finally, we set up a nonlinear and flexible ANN model to forecast the series. Since the test results indicate that crude oil futures prices follow a complex nonlinear dynamic process, we expect that the ANN model will improve forecasting accuracy. A comparison of the results of the forecasts among different models confirms that this is indeed the case. Performance-based regulation (PBR) is influenced by the Bayesian and non-Bayesian incentive mechanisms. While Bayesian incentives are impractical for direct implementation, the insights from their properties can be combined with practical non-Bayesian mechanisms for application to transmission pricing. This combination suggests an approach based on the distinction between ultra-short, short and long periods. Ultra-short periods are marked by real-time pricing of point-to-point transmission services. Pricing in short periods involves fixed fees and adjustments via price-cap formulas or profit sharing. Productivity-enhancing incentives have to be tempered by long-term commitment considerations, so that profit sharing may dominate pure price caps. Investment incentives require long-term adjustments based on rate-of-return regulation with a �used and useful� criterion. We analyze the efficiency, distributional, and environmental effects of real-time pricing (RTP) adoption in the short run. Consistent with theory, our simulations of the PJM electricity market show that RTP adoption improves efficiency and compresses the distributions of loads and prices. Adoption increases average load but decreases operating profits with the largest decrease for oil-fired generation (59% when all customers adopt). Consumer surplus and welfare gains are modest (2.5% and 0.24% of the energy bill), and emissions of SO2 and NOx increase but CO2 emissions decrease. Approximately 30% of these efficiency gains could be captured by varying flat rates monthly instead of annually. Monthly flat rate adjustment has many of the same effects as RTP adoption, captures more of the deadweight loss than time of use (TOU) rates, and requires no new metering technology. Models used to test whether an environmental Kuznets curve (EKC) can be used to describe the relationship between GDP and energy use and/or carbon emissions may be biased by the omission of energy prices. Here we include real energy prices and fuel shares in models that describe energy use and carbon emissions. We test if these models show a turning point in OECD countries. Results indicate that including energy prices eliminates statistical support for a turning point and suggest that the relationship between income and both energy use and carbon emissions is represented most accurately by diminishing returns. These results imply that economic growth per se will not reduce energy use or emissions that cause global climate change.